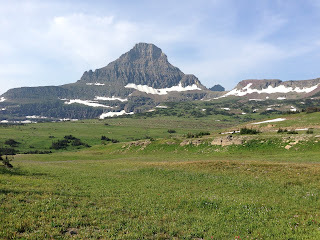 Of course, as usual, we were up and out of the campground early, arriving in Glacier National Park long before our check in time at Fish Creek Campground. 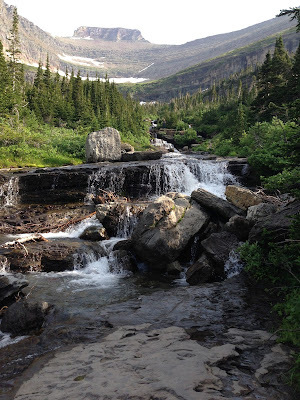 After stopping at the Visitor Center, a hub with free shuttles running up and down the Going-to-the-Sun Road, we decided to use our morning to head up the only unpaved road available to Bowman Lake. I think the ranger didn't realize how rutted our Sonoma County roads are when she suggested that the road was really bumpy. By 4 wheel drive roads it was probably a 1 1/2, narrow in some spots, but not too rough. It was only about 6 miles of slow driving, but well worth the trek. The campground probably would have had space last night, but I bet they have some feisty mosquitoes in that area. 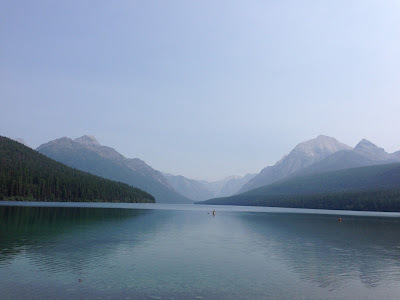 After watching a young fisherman, who is visiable as a spot in the center of the lake in the photo, catch fish and lose them one after another we decided that it would be after one by the time we got to our campground, so we headed back. Once set up in our campsite on a hillside, we drove up to Lake McDonald Lodge to see what it was like. After exploring the shoreline around the lodge we headed to Apgar for ice cream. The man in front of us said the huckleberry ice cream was so good, after having had it yesterday, he was back for again for another. 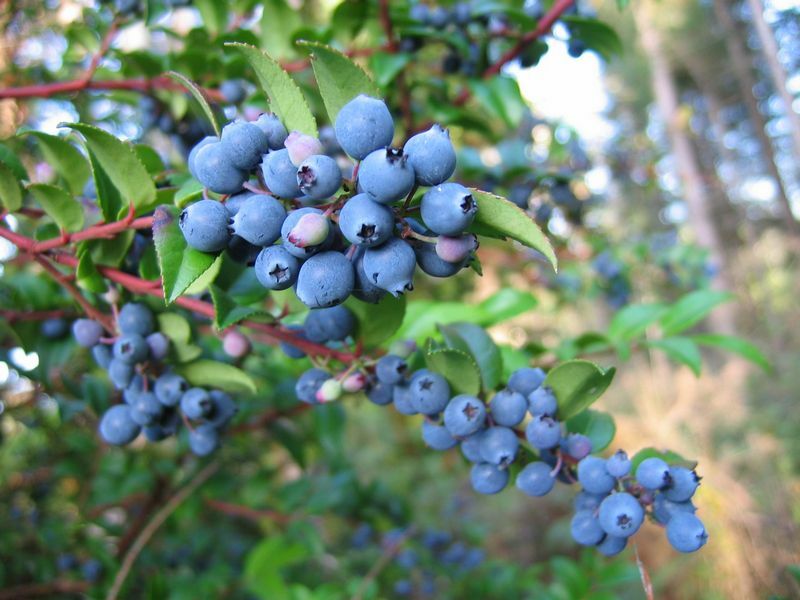 What is a huckleberry anyway? I thought it was a hound! We thought the ice cream was just alright. I didn't feel it was as flavorful as blackberry, we didn't feel a need to return a second day. Later in the afternoon, after things were nice and overly warm, we hiked to Rocky Point, about a mile and a half round trip from our site. It was nice to have the lake just across the road and down the hill from our campsite. We chatted briefly, and awkwardly, with our neighbors from Sweden, who had shipped an RV over and were touring the United States, New York to San Francisco and Alaska too! Around 7:00, we left our campsite for the east side of the park, traveling over the famous and beautiful Going to the Sun Highway, stopping at the top at the Logan Pass Visitor Center at 8:45. At that early hour the parking lot was already half full. The Park Newspaper said that the lot fill up by 10:30. After we admired the area around the Visitor Center we continued on to Saint Mary arriving in the town at 11:00. On the east side of Logan Pass the blacktop was being re-done, causing us to sit for about 30 minutes waiting for a pilot car and closing all the east bound view areas. There was no stopping to photograph Lake Saint Mary. Many Glacier Hotel reminded us of the Ahwahnee, with it's huge pillars, large dining room and beautiful views. 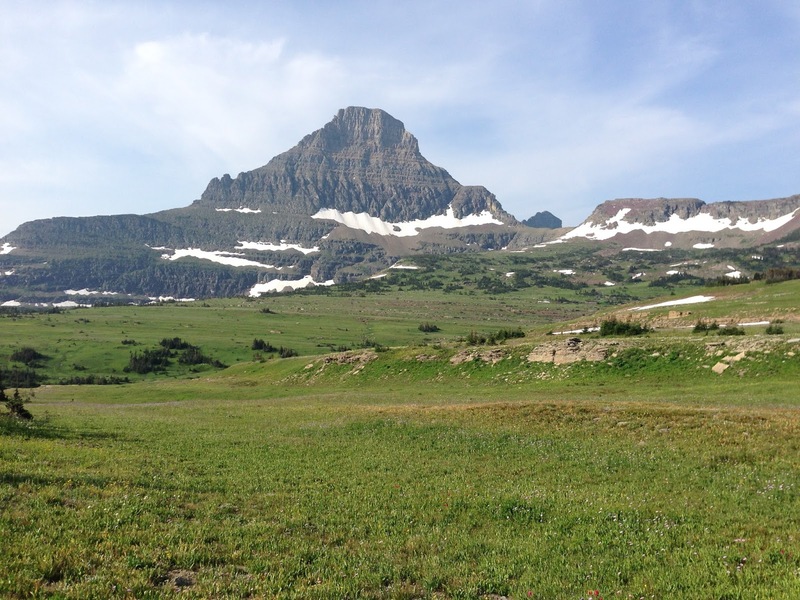 Many Glacier Hotel is celebrating its hundredth birthday this year. While in the market in Forks, Washington the clerk told us that the pillars in Many Glacier Lodge came from the area near Forks, along with giving us tips to ward off the mosquitoes that didn't work so well. We arrived just as they were beginning to seat people for lunch and shared a bison burger with grilled mushrooms and onions, a mixed vegetable salad, and two Arnold Palmers. Not bad to enjoy a great lunch and fabulous view for $28.50. After lunch we continued south to Two Medicine Lake. The road coming in from the north is narrow and windy, with no large rigs allowed, they could easily get in to this location from the south road. Just as we arrived, so did the thunder and lightening. We watched as boaters returned to the shore. Running Eagles Falls was a short trail on the road to Two Medicine Lake. Pictures I had seen showed water also spilling over the very top of the rocks, not this year! Our one day drive around Glacier National Park, the pink line! Returning through East Glacier and Essex to West Glacier on Highway 49 to Highway 2 made this a loop. As we were leaving Essex the storm really let loose and poured. Arriving in West Glacier the rain had cleared the smoke from the skies. We stopped in the small town of West Glacier and walked through a farmers market before asking at the Alberta Visitor Center if they knew of a place where we could pay to take a shower. The young girls said she believed at one of the motels in town. We asked the proprietor of the motel and he sent us to an outfitter, sporting goods store about a mile out of the park where they sold showers in a private bathroom with towels and all for $8.00. We arrived just in time, a line was forming as we were finishing up! We choose not to try the 1 set of showers for 178 campsites in our campground when the ranger told us the water was never hot. Rain cleared out the smoke on the west side and the temperature at the campsite was a steamy 96 when we arrived back at camp. During the evening we packed things up because of the rain drops that were falling and so we could get away early heading to Waterton Lakes, Banff and Jasper. Neither of us were any longer excited about the prospect of the heat in Eastern Washington and Oregon on the way back to California. Why not head north and stay cool? We had quite a rainstorm all during the night, cooling things off and lulling us to sleep.